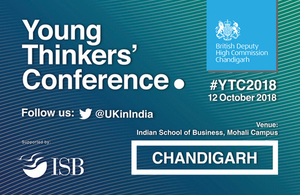 The Young Thinkers’ Conference is the British High Commission’s flagship foreign and security policy conference, which brings together the best and brightest experts and young thinkers to discuss a range of issues. Already well established in Delhi, where it has been held for the last seven years, the conference made its Chandigarh debut in 2016. Building on the success of the previous editions, the conference is back in the city with an impressive line-up of speakers. Energy Security and Climate Change: How to shape India’s Sustainable Development? Youth in Politics: What difference can they make? The truth behind Fake News and how best to tackle it? V.P Singh Badnore, Governor of Punjab and Administrator UT Chandigarh will deliver the inaugural address on Friday morning. I’m really looking forward to this conference. It brings together great speakers and experts, discussing a wide range of subjects – there really is something for everyone. We hope it will help to build understanding of a range of issues that shape the region and world in which we live. It is also an important element of our engagement with younger Indians – both those who already have expertise in the subjects we’re discussing and those who are simply curious and want to learn more.